You can't be the best and be like the rest. Clean the chicken and put into a plastic ziploc bag. Pour yogurt over chicken and refrigerate for at least two hours. You may optionally salt and pepper the chicken before adding to the bag. It’s your only chance to season the meat. Combine the crackers, cheese, and herbs into coarse crumbs. I use a small food processor. Melt half of the butter and pour into bottom of a baking dish. Dredge the chicken in the breadcrumb mixture and set into buttered baking dish. Pour remaining butter over chicken. Bake for 35-45 minutes in a 350 degree oven until golden brown. I didn’t get a decent photograph of the final product this time. I am planning on making this again this week, so maybe better luck? With one of the gift cards I received this holiday, I purchased a yogurt maker. I had my eye on one for several months, but when I finally went to make my purchase the price kept climbing higher and higher. I had to re-evaluate and I’m so glad I did. The traditional way of making yogurt at home involves sterilizing a set of glass cups and lids, cooking the milk to kill the bad bacteria, then adding back the good. Let the milk cool, then add it to the cups, then cook for a half day. This was the way I thought yogurt had to be made at home. 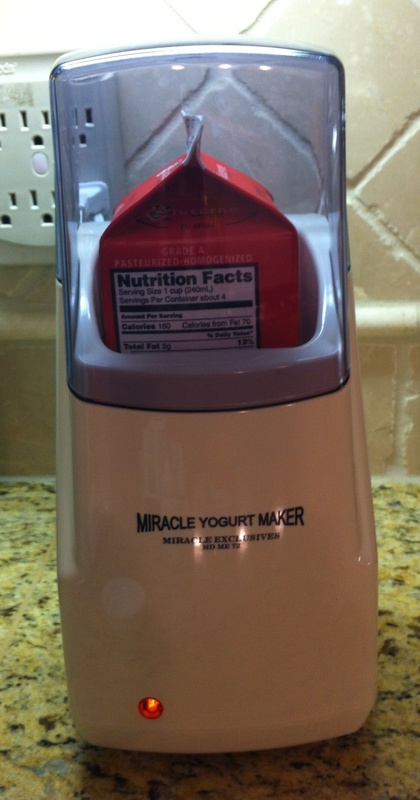 May I introduce the Miracle Yogurt Maker. A Miracle Exclusives exclusive. The genius behind this method is that you start with a fresh, unopened liter (quart) of milk, soy milk, half-and-half or goats milk. You don’t have to sterilize the milk because you assume that unopened it stays clean. 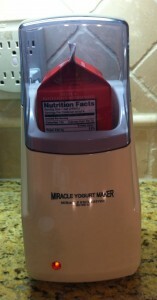 The yogurt cooks in the milk container, so you skip the sterilization steps. You do have to open the milk container to add a yogurt starter. You have choices to make before you inoculate. If you have 50 ml (10 teaspoons) of yogurt from the previous batch and that batch is plain (unflavored) then you can add it to the new milk container and shake. If you don’t have leftovers or it has been flavored (or sweetened), then you can use a commercial yogurt starter. 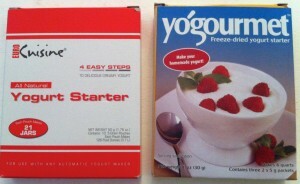 You will only need 5 grams (one packet) of starter. They are all pretty much the same. They all include the three bacteria that do all the work: L bulgaricus , S thermophilus, L acidophilus. The brands you encounter may vary with the amounts of powdered milk, sucrose, and ascorbic acid (Vitamin C). 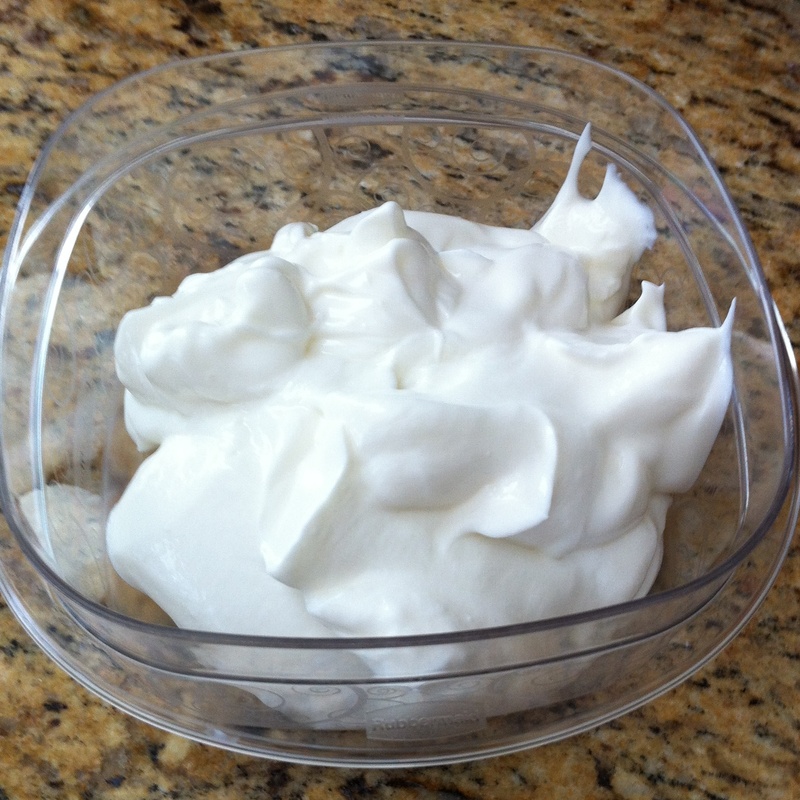 Optionally, you can buy a small container of plain yogurt at the store and add it to the milk. Here are two brands I have tried. Honestly, I did not find them any different, except for price. For my first batch I used regular whole (pasteurized) milk, the kind you get at your local grocery store. I cooked it for 14 hours and it was quite delicious. I used half of it as a marinade and the other half I had over a couple of small bowls of granola. I used 50 ml of that batch to start the second. I wanted to try to create something a little thicker. I wanted to spoon it out, not pour. I cooked it for 20 hours. It did come out a bit thicker, tremendous. I used half of it on granola and the other half in my first cheese experiment. Cheese? 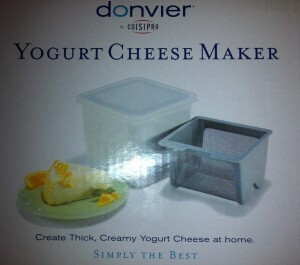 Along with my Miracle Yogurt maker, I also bought (separately) a yogurt cheese maker. It’s a plastic box with a stainless steel strainer suspended within. I added the yogurt and let the whey fall out (in the refrigerator). What was left was thicker than sour cream and twice as creamy, almost cream cheese. You can do the same with a double layer piece of cheesecloth. I admit at this point, I was hooked. I used yogurt from batch two to make batch three (the grandchildren). This process can repeat 10 to 15 times before you need a new packet of starter. This time, however, I scraped out the innards of one whole vanilla bean and added it to the milk before cooking. Fourty-eight hours later I served my home-made vanilla yogurt with granola for Christmas brunch. When I did a search for ‘plain yogurt’ on food.com, I found over six thousand recipes. I give it five out of five stars. Best $40 spent.